Integral treatment of air superiority, amphibious assaults, airborne troops, sieges, and everything else that's important when the enemy is in sight. 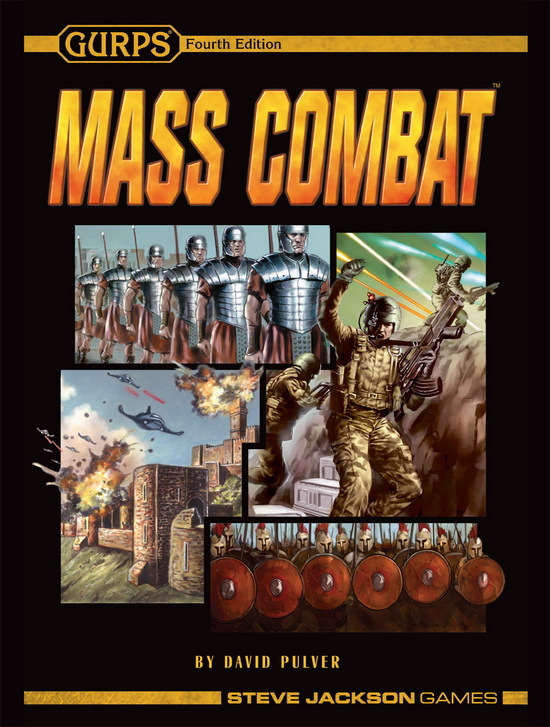 Everything is fast and easy to use in play thanks to extensive examples, quick-reference tables, and ready-to-go stats for the strength, weaponry, and mobility of numerous unit types. It's all generic, too, covering realistic, fantastic, and superscience troops at every tech level, and providing guidelines for customizing their quality, special training, and equipment. And it never loses sight of the fact that GURPS is a roleplaying game – every hero gets a chance to shine, and the rules emphasize what the PCs do and what happens to them. GURPS City Stats provides GURPS information on how cities intersect with these mass-combat rules. 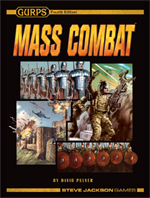 Pyramid #3/44: Alternate GURPS II has variant options that expand the Mass Combat rules to a tabletop tactical system. Pyramid #3/65: Alternate GURPS III contains optional rules that expand possibilities for working together, which can turn the tide of battle! Pyramid #3/67: Tools of the Trade – Villains has five ready-to-use Mass Combat armies, perfect for causing trouble for meddlesome heroes. Pyramid #3/70: Fourth Edition Festival offers Mass Combat ideas and troops for GURPS Banestorm: Abydos . . . plus stats for the forces of Abydos' enemies! Pyramid #3/77: Combat provides Mass Combat troops for two armies: one from the Egyptian New Kingdom and the other from early Imperial Rome! Pyramid #3/80: Fantasy Threats has details on the army of Baron Vordag, a tyrant who's a great foe for fantasy heroes. Pyramid #3/84: Perspectives gives more detailed rules for determining the Mass Combat troop strength of individual heroes. Pyramid #3/93: Cops and Lawyers delivers new Mass Combat units for police and large criminal groups.